It took just one game for Aaron Davis to show what kind of impact he would have this winter. With most Minnesotans still sleeping off their turkey-induced daze way back on Nov. 27, the Mound-Westonka senior goaltender hypnotized the high-scoring Virginia/Mountain Iron-Buhl offense in the season opener, turning away all 45 shots in a shocking 3-0 victory. More than a few hockey fans around the state might have been surprised by the result, but Davis has been far more than a one-hit wonder. Through 16 games played, the three-sport athlete has been busy with an 8-6-2 record, 2.03 goals against and .939 save percentage, which ranks second in the state to Minnetonka’s Jim Kruger. But Davis has faced a big load of 33.2 shots per game and has played into overtime in five of his last seven starts. Runke added that Davis is a competitor with terrific reaction time and an uncanny ability to focus on the puck through screens. Add in the ability to control his rebounds and Davis has proven very tough to beat this year. Even with three straight losses and a tie by a combined five goals since upsetting Hopkins by a goal, Mound-Westonka remains on track for a high seed in the Section 2A playoffs – thanks to Davis. This past week, the Breakdown spoke to Davis about playing in low-scoring nail-biters with the White Hawks, painting his own goalie helmet and what it might take to beat Breck in the upcoming Section 2A playoffs. 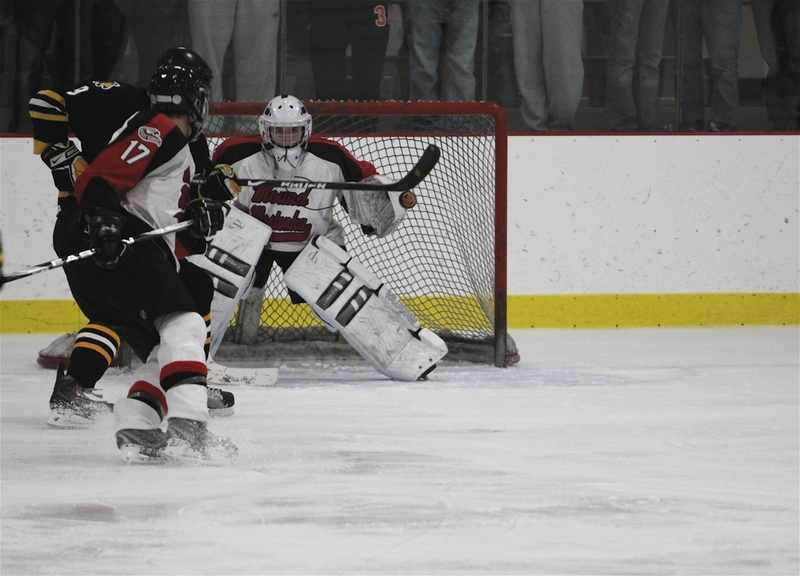 Breakdown: Tell me about the outlook for Mound-Westonka hockey this winter? What kind of goals has the team set? Davis: Some of the goals are smaller such as blocking a certain amount of shots and others larger like winning certain games or series, but either way (we’ve) found that the more goals we achieve the more success we tend to have. So far we’ve kept an active mindset about our goals and have had some very exciting, possibly unexpected wins but also some disappointing losses. Breakdown: You got a close look at Breck last year in the Section 2A finals. What might it take to beat them this year? Davis: Breck was a very tough opponent last year and we were very proud of ourselves for hanging with them for the better part of two periods. This year, we all hope that we can do even better, but it starts with making it to the game against Breck. In order to beat them though we would basically need a perfect performance out of everyone that night. We would need to run all our systems without errors, play with our best efforts, and have an utter desire to win. Breakdown: You guys have been playing a lot of very low-scoring games so far. How does that reflect the style of play for the White Hawks? And how does that fit into what you provide the team? Davis: The players have been very consistent with providing good support in front of the net and have increased the amount of shots blocked as they gain more confidence. (We have a) grinding style of play and willingness to sacrifice our bodies for the greater good. As far as I go, I just go out there every night and try to stop every shot that comes at me. It helps immensely that my teammates are willing to block shots and clear pucks. Breakdown: Give me a scouting report on yourself. What makes you such a good goaltender? Davis: Like I said earlier, I just go out there every night and try my best to stop every puck that comes at me -- but I wouldn't be anywhere without my teammates and great coaches, who are very supportive and encouraging. I also have a great goalie coach (Ryan Ess), who I've been working with for several years now and has always supported and encouraged me. He pushes me every practice and isn't afraid to tell me what I'm doing wrong. With those, as well as a willingness to work and desire to get better, I have the ability to play the way I am. Davis: On-ice, the variety is maintained by focusing on many aspects of my game such as angles, movements, rebounds, etc. which provides an opportunity for myself to work on all my skills on ice. Off-ice focuses more on the strength aspect as well as the flexibility that is necessary to play. Davis: I enjoy building and fixing things around the house and I have even at times repaired my own goalie equipment when it tears or breaks. I have even gone as far as painting my own goalie helmets and these activities have come to be somewhat of a hobby. Davis: I’ve never really had one definitive player that I’ve followed up to this point but as I’ve developed and changed my style, the goalie that I pay the most attention to has changed as well. When I was younger it was Martin Brodeur and Dominik Hasek. Nowadays I tend to pay the most attention to Niklas Backstrom because he's the goalie of the Minnesota Wild. Style-wise my goalie coach has trained me in a style that highlights the skills of Roberto Luongo and Miikka Kiprusoff, a hybrid between the two. Davis: High school sports have predominantly controlled my life for the past couple years. I participate in soccer in the fall and baseball in the spring and those too have their off-season training. With so much overlap, it’s difficult to find much else to do but I still enjoy several hobbies such as building and fixing things and creating artwork. I also assist my goalie coach with coaching in the community, am a member of our schools’ National Honor Society and find some time to work. Davis: My favorite part of high school has definitely been the sports. It’s an escape everyday from behind a desk. Also the camaraderie I've received from playing sports and competing with my friends every day has made high school a much more enjoyable place to be with that to look forward to when the final bell has rang.